New Public Safety Officers Chad Murray, left, Chris Doyle and Deimos are sworn in as new public safety officers by Georgia Southern Police Chief Laura McCullough. 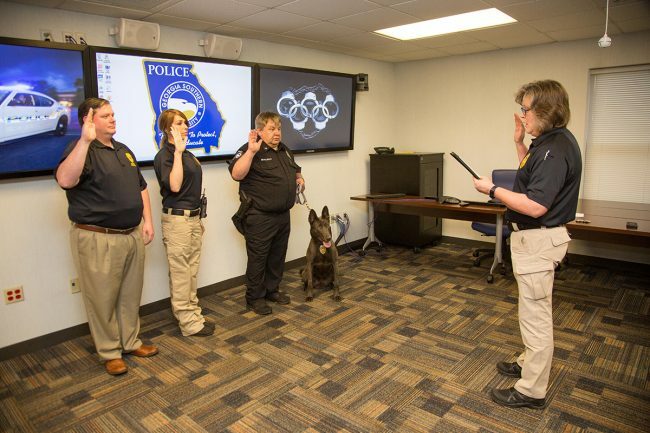 Georgia Southern University officially welcomed two new public safety officers and one dedicated K-9 officer to the force. Georgia Southern’s Office of Public Safety now has 39 officers who not only serve the University’s campus but also assist local agencies. Officer Chad Murray and Officer Chris Doyle were sworn in by Chief Laura McCullough in a ceremony on campus. K-9 officer Deimos also is new to Georgia Southern’s police department. The Dutch Shepherd is the first canine on the force and the only explosives detection K-9 in Bulloch County. With a trained ability to detect 18 different odors, he will work alongside Patrol Officer Erk McCurdy to assist with explosives sweeps and the needs of other agencies.